Methi na Dhebra is a flatbread made with pearl millet / Bajra flour and fresh fenugreek leaves . The bread is a staple in Gujrati homes. Since the bread has a good shelf life it is an excellent food to carry while traveling . Methi na Dhebras are generally made during winters , as winters is the time when you get fresh fenugreek . Pearl millet or bajra is normally consumed in winters as bajra is difficult to digest in summers . We all are aware of the benefits of this flour . It is gluten free and is full of minerals . The bajra roti takes time to digest and as a result keeps you full for a long time . A bajra rotla with some fresh green garlic is a rustic meal and very popular among the Rabari community of Gujrat . they have a an art of making these rotlas with their palms , something that I keep gazing . Methi or fenugreek is a leafy vegetable with excellent health benefits. It is used as a herb, spice and a vegetable. It is rich in iron and calcium . A combination of bajra and methi makes the Dhebra a very nutritious flat bread . The Dhebras are normally served as a evening snack with some hot Elaichi wali Chai . It can also be served with Chundo the famous Gujju sweet mango pickle. 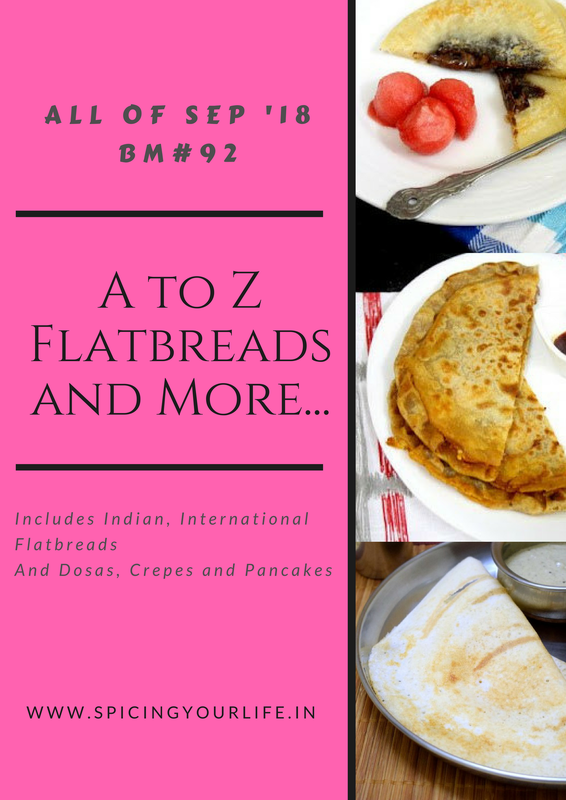 The evening snack is called Nashto in Gujrati and a combination of Dhebra , along with some Bateta nu shaak , Vanela Ganthia , papite me Cheen, Marcha ,God Papdi and Chai make a perfect evening spread and this is what I served for the alphabet ‘ M ‘ under the theme Flatbreads and More . Pick and clean the fenugreek leaves . Wash well and chop finely . Place in a sieve so that the water drains completely . Using a mixing bowl , add all ingredients for dhebra and mix well . After mixing check the taste , you could adjust the ingredients as per your taste . Gradually add water and bind the dough . Pinch out balls and flatten each one with your palms . You can pat the dhebras with hands or roll them in between plastic sheets . Place on a hot griddle . Reduce the flame to medium and let cook till brown spots appear . Flip over and apply ghee lavishly . Flip over and apply ghee on this side too . Now increase the flame and cook . Cook till brown spots appear . If you wish you can make the debhras into 4” disc or even smaller and deep fry . The bajra and methi combination looks so fabulous! And the thali queen has struck again with yet another mind blowing thali…what more can I say but that I want to eat it all!!! Looking at the thali itself i gained few kgs Vaishali.. How fabulous those dhebras looks. Extremely nutritious and highly irresistible. When I made dhebra, I couldn’t get fresh methi, so I used kasuri methi instead. But when ever I get fresh methi, I am going to try your version. That snack spread looks super inviting Vaishali. Please invite me..
Love the variation of rotis with bajra flour. The whole breakfast setup is very appetizing. I love dhebra. I think this BM is increasing my knowledge in terms of cuisine wise recipes. We make this at home but did not know that it is called methi na dhebra. bajra bhakhri, vada, paratha with methi, with onion such combination I keep making. Looking awesome platter and surely will make again the way you made them. Loving this platter. You should have told us earlier that your platter are going to be so yummy, I would have shifted to your place for all the month you making this Flatbreads. Each and everyone is simply out of the world. Methi na Dhebra is such a healthy and drooling share. Vaishali, today is Ekadashi and I’m drooling over your clicks! I just love methi na dhebra, its a regular flatbread at my place. You’re so right, they are popular in all Gujarati homes. I was only about 12 when my grandmother insisted that I make them for her and she supervised! So dhebras also are associated with fond memories for me. Gosh you have literally made each dish as part of a complete meal! This set looks awesome Vaishali. I remember rotla making we saw at your place. And I can never forget the fresh green garlic condiment. I understand papite me Cheen is payapa dish?..whats athadu?..will get the list from you on this..
Aathandu is pickle , the Gujju word ! Personally I love dhebra but.. making poori is more simple technique compare to paratha.. love your recipe. Look at that platter. Each and every dish is mouthwatering. Interesting to learn all the different kinds of recipe from the Gujarati cuisine. The Methi dhebra looks absolutely mouthwatering and I am tempted to taste that garlic green chili paste. For me this Nashto would be a meal by itself instead of having it as tea time treat. The Debras look so lovely and you have taken so much time in preparing and setting up each platter Vaishali!